The French artist, Maurice Estève, was born in Culan on the 2nd May, 1904. In 1913 his family moved to Paris. Estève was very impressed by the Louvre and in 1915 and began to study drawing by himself. He worked in a printing house and various workshops to earn his living and studied drawing in the evenings. In 1923 he went to Barcelona and worked in a textile design factory. He returned to Paris in 1924 and attended a free art studio at the Colarossi Academy. Estève’s artistic style was shaped by the museums and art galleries of Paris and particularly influenced by Paul Cézanne, Henri Matisse, Pablo Picasso, Georges Braque, Henri Léger and Robert Delaunay, among others. Estève’s first solo exhibition was held in Paris in 1930 and this brought him recognition and prestige in French artistic circles. In the 1930s he exhibited at the Salon des Indépendants and the Salon des Tuileries. He sold his first picture in 1934 at the Retrospective Exhibition of French Art in Sweden and after this regularly exhibited at the Autumn Salons in Paris. In 1937 Robert Delaunay, one of the pillars of modernism, suggested to Estève that he help him paint some enormous panels for the Paris International Exhibition pavilions. Working with Delaunay on these panels had a great effect on Estève’s life. At the outbreak of war Estève was called up to serve in the army, but was demobilised in 1940. Between 1940-1942 he exhibited in group exhibitions in Paris. Estève was one of a nucleus of artists who brought recognition to the “School of Paris” after 1945. Today Estève is considered one of the greatest European representatives of tachisme. The tachisme movement (derived from the French word tache – a stain) developed in France in the 1950s and 1960s. Estève’s paintings of the 1950s and 1960s are abstract and based on bright combinations of areas of colour ranging in shape from simple geometric forms to round amorphous outlines. The essence of the work is in the emotional force produced by the impact of the brightly-coloured contrasting shapes in the picture. 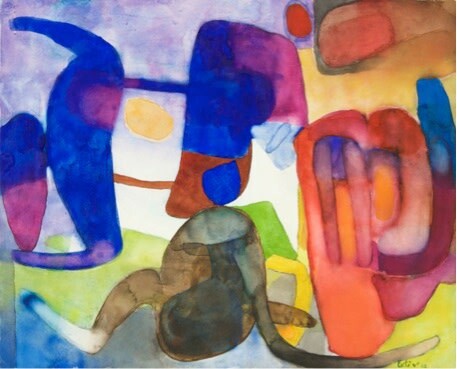 Estève’s decorative compositions and watercolours sometimes call to mind coloured mosaics and dazzle the viewer with their unexpected, fantastical shapes and the brilliance of their clean, clear-cut colours which create “colour symphonies” of sound. By the 1960s Estève had achieved wide international recognition. In 1954 he took part in the Venice Biennale. In 1956 he had a solo exhibition in Copenhagen and in 1961 an exhibition in Dusseldorf. In 1970 he was awarded the Grand Prix National des Arts, and in 1986 a postage stamp with a reproduction of one of his works was issued in France. In 1987 the Musée Estève was opened in Bourges in France. In 1995 the artist returned to his hometown of Culan and lived there until the end of his life. Estève’s works can be found in the Museum of Modern Art (MOMA) in New York, in the Tate Gallery in London, in the famous Saatchi collection and in many other private collections. Interest in him continues to grow, and consequently his works have been successfully sold at Sotheby’s and at other auction houses around the world.